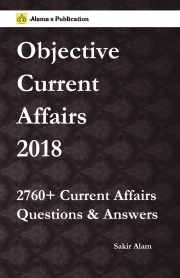 Description of "Objective Current Affairs 2018"
The listed are the major newspapers which an aspirant must read to fetch good score in General studies Paper of prelims and mains in civil services exam. After a long time effort we are able to compose this kindle and hence reduced the aspirants efforts. Objective Current Affairs 2018 (January 2017 - February 2018) captures the Most Important Events, Issues, Ideas & People of 2017 in a very lucid ans student friendly manner. It is essential for aspirants to keep themselves updated as just knowing things can get them more marks in such exams. Moreover Current Affairs prove to be very important tool to handle GD and PI. It comes in handy for the aspirants of UPSC, SSC, Banking, Insurance, Railways, Engg. Services and AFCAT etc. Infographics, Charts and MindMaps have facilitated information quickly and clearly. The information provided in the Current Affairs 2017 is in line with the analysis of previous years' competitive exams papers which will help aspirants update on all happenings across India and the world. Reviews of "Objective Current Affairs 2018"